Some relational database products provide a full programming environment. Such systems include Access, ORACLE, Paradox. At one time these integrated environments were labelled as 4GLs. This term quickly became overused, and the term 4GL has largely fallen into disuse. A mechanism for creating tables and entering raw data into the tables. Such a table editor will often provide a means of establishing foreign keys and simple format restrictions. A tool for creating applications. Often the user will be isolated from the raw data entry mechanism. A protected environment can be built by a database designer; users are then presented with a simplified view of the data. Some kind of programming language is usually built in. The database engine is not normally visible to the user or even the programmer - indeed it should be possible for the programmer to switch between engines relatively painlessly. The very speed of development can cause long term difficulties - things that start as prototypes tend to become products. The proprietary nature of the products they are based on can cause constant update problems. Rather than developing in a proprietary, specialist language (VBA, dBase, PL) we can develop in a well established, general purpose language (C, C++, Pascal) and link to a database engine. Each of these approaches involves the notion of a cursor. Having a single standard API can give many advantages to the programmer. Ideally a programmer can write and compile a program using a particular database product (such as Microsoft SQL Server) then switch to another database vendor (such as Oracle) with only a trivial change to the code. As both manufacturers provide an implementation of the API the code should work equally well in both cases. malevolent database vendors trick programmers into using non-standard SQL so that the code is “locked into” a single product. The following example is for Delphi. A similar functionality is available in VB and other languages. The loop terminates when the cursor attempts to move on from the final record. This example shows a data-linked text box in Visual Basic. Other components are possible. Other languages have similar mechanisms. The data source Data1 has it's "record source" property set to a pre-existing table "ANIMALS"
Text1 is a data-linked or data-aware component. The property Text1.DataSource is set to Data1, the property Text1.DataField is set to "NAME"
Text1 may also be set up to automatically update the database if the user performs an edit. The following code is a simple embedded SQL program, written in C. The program illustrates many, but not all, of the embedded SQL techniques. The program prompts the user for an order number, retrieves the customer number, salesperson, and status of the order, and displays the retrieved information on the screen. An ideal API is one that connects many development platforms to many database implementations. It allows application designers to give their users access to many databases; it allows database manufacturers to provide an interface to many application platforms. Without a standard each language would have to provide an interface to each database implementation. Specified by Microsoft and principally associated with the MS Windows platform, ODBC includes a basic set of routines to connect to a database engine. 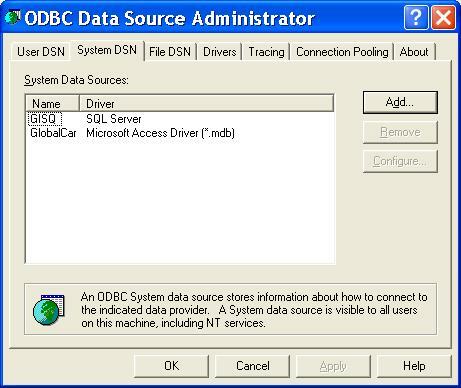 ODBC connections can be set up from the control panel on a windows machine. This is a popular and successful API. Most programming languages can form an ODBC connection without reference to the underlying database product. Most database products can fulfill the API. The column number. Column 0 is the bookmark column; this column is not included in some result sets. All other columns are numbered starting with the number 1. It is an error to bind a higher numbered column than there are columns in the result set; this error cannot be detected until the result set has been created, so it is returned by SQLFetch, not SQLBindCol. The C data type, address, and byte length of the variable bound to the column. It is an error to specify a C data type to which the SQL data type of the column cannot be converted; this error might not be detected until the result set has been created, so it is returned by SQLFetch, not SQLBindCol. The address of a length/indicator buffer. The length/indicator buffer is optional. It is used to return the byte length of binary or character data or return SQL_NULL_DATA if the data is NULL. When SQLBindCol is called, the driver associates this information with the statement. When each row of data is fetched, it uses the information to place the data for each column in the bound application variables. For example, the following code binds variables to the SalesPerson and CustID columns. Data for the columns will be returned in SalesPerson and CustID. Because SalesPerson is a character buffer, the application specifies its byte length (11) so the driver can determine whether to truncate the data. The byte length of the returned title, or whether it is NULL, will be returned in SalesPersonLenOrInd. Because CustID is an integer variable and has fixed length, there is no need to specify its byte length; the driver assumes it is sizeof(SQLUINTEGER). The byte length of the returned customer ID data, or whether it is NULL, will be returned in CustIDInd. Note that the application is only interested in whether the salary is NULL, because the byte length is always sizeof(SQLUINTEGER). // Bind SalesPerson to the SalesPerson column and CustID to the CustID column. // Execute a statement to get the sales person/customer of all orders. // equals SQL_ERROR or SQL_SUCCESS_WITH_INFO not shown. JDBC provides a similar level of functionality to ODBC but is specific to the Java programming language. In the code shown a connection is made to the mysql database using the getConnection method – we specify the machine on which mysql is running (pc236nt.napier.ac.uk), the mysql database (gisq), the user name (scott) and the password (tiger). Having created an SQL statement we get a ResultSet object by executing the SQL statement over the connection. For the statement given we get four rows each with a single column – these are the countries China, India, United States and Indonesia. The ResultSet object is a cursor that points to a single row of the result table. Initially the cursor is considered to be pointing to before the first row, the method result.next() is the first instruction – this moves it on to the first row. We can retrieve data from the ResultSet using the getString method. The getString method takes either an attribute name (as in this case) or an integer indicating the position of the attribute. In either case the value of that field is returned as a string. Similar methods such as getInteger are available. An API which is growing in popularity is the DBI/DBD interface. This is an attempt to offer a standard programmers interface to executing SQL from a variety of languages. It has many similarities to ODBC, but without some of the complexities. It is a popular database linking API for Perl. The following is a fragment of Perl example code for finding out the surname of employees with a particular department number. ASP programming allows data from a database to be displayed on web pages. 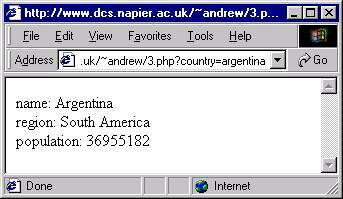 The ASP script (often VBScript or JScript) is interpreted at the Web server. 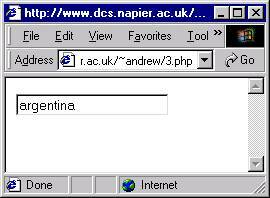 The web client (the browser) receives plain HTML. The RDBMS (probably SQL Server) gets the SQL request and returns the results. <%SQL="SELECT carName FROM Cars ORDER BY carName"
set conn = server.createobject("ADODB.Connection")conn.open "parking"
No matter how the connection to the database is made, care should be taken to ensure that the connection is handled efficiently. The application connecting to a database is typically executing on a different machine to the database server. This has many advantages – and is essential if the database is to be shared by more than one user machine. However having the application program and the database server on different machines introduces a significant performance cost. Establishing a connection, including time to log on and verify passwords can be costly. Communication between the application machine and the server must go across a network – this is usually considerably slower than the disk transfer rate. Sending SQL statements to the server is relatively trivial however sending the rows of the results back may be significant. Programmers should take care to request only the data they need, lazy programmers may be tempted to request “SELECT * FROM table” when “SELECT id FROM table” would do. In the first case all fields may be sent across the network for every row examined – this can be very expensive especially if there are many fields or some of them are lengthy. As an example consider a web site configured to dynamically create and serve web pages from stored database information. When the server program is generating web pages it may be that database connections are being created rapidly to solve relatively trivial requests. It is not uncommon for this type of web server to be spending far more time opening and closing connections than anything else. In such cases connection pooling may help. The web-server creates a pool of connections and keeps these open between requests. This may be transparent to the application programmer.